ATLANTIC OCEAN --- A Finnish Air Force pilot made history for his country by becoming the first to land an F/A-18C Hornet on a United States aircraft carrier, March 17. Capt. 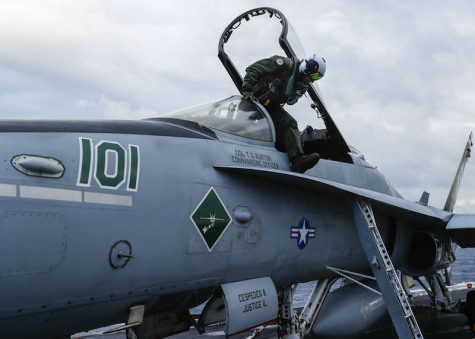 Juha "Stallion" Jrvinen preformed an arrested landing on the Nimitz-Class aircraft carrier USS Abraham Lincoln (CVN 72) and is currently attached to Marine Fighter Attack Training Squadron (VMFAT) 101 to become qualified as a pilot instructor. "It was pretty intense," said Jrvinen. "I was extremely happy because I knew I actually caught the wire when I felt the sensation of rapidly slowing down, but at the same time I was a little disappointed because I caught the second wire and not the third." Before landing on an aircraft carrier, Jrvinen had to complete the same training that Navy and Marine Corps pilots undergo. "We put him through the same repetitions of fuel carrier landing practice events that all students go through," said Maj. Shane Bursae, an instructor for VMFAT 101. "The purpose of this is so that when he does move on to teach students in the Finnish Air Force, he has knowledge and first-hand experience of what he is teaching." "The training is very valuable to me," said Jrvinen. "The way they fly is so different to what I'm used to, and I think the instructors figured out the perfect syllabus to train students." "Seeing it happen, I was absolutely excited," said Bursae. "Having done it myself, I was happy that he could share in the challenge of it, but also the excitement of everything that goes with shipboard operations." "I think the program is a really good opportunity to see how other countries' pilots operate and train," said United States Marine Corps Capt. Michael Harp, the pilot schedules officer for VMFAT 101. "It's also cool from a cultural stand point to work with pilots from another country." "I'm excited to bring back a lot of real experience," said Jrvinen. "Not theory, but real life training experience. Now this is all reality to me, and I have a better understanding of the big picture."